1. After the Allied liberation of Rome in 1944 Italians and Americans were eating eggs and bacon supplied by troops from the United States. 2. Carbonaro means charcoal burner. This theory says that this was a dish eaten by Italian coal miners. 3. It also could be that Carbonari created this dish in 19th-century. Carbonari was secret political organization which aim was the creation of a constitutional monarchy or a republic. 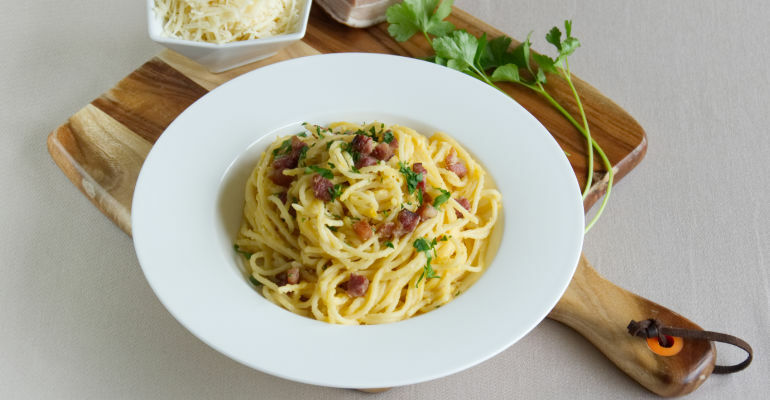 Like many other polish people I have tried Carbonara with cream. And I am sure at this point all Italians would just go mad. But this is how it is – I have experienced French people eating pierogi with ketchup. Here I want to excuse other nations – we don’t know what is traditional! And suddenly this happy day in my life arrived, and I got to know the real Carbonara. It was a hot day, and I was on a weekend trip to visit my Erasmus friend Sergio in Torino. He has invited us to his home and made the real Italian Carbonara. I still remember how surprised I was watching him cooking. 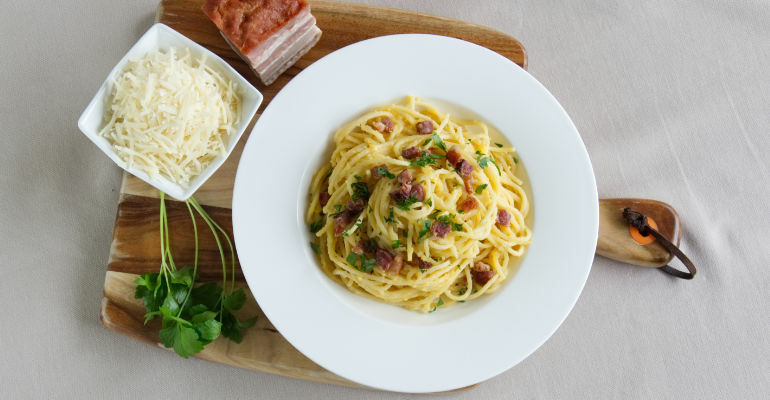 From that day on I have never made or eaten different Carbonara then the traditional one. You can say whatever you like – tradition rulez! Cook the pasta in a pot with salty water al’dente. Follow the instructions on the pasta package. Heat up olive oil in frying pan. Fry guanciale/pancetta on medium heat until crisp. Take a seperate bowl and combine eggs, cheese and a pinch of salt using the fork. When the pasta is ready rinse it and put it in the pan with bacon and olive oil. Mix it all and leave for 1-2 minutes. Remove the pan from the heat, add the cheese and egg mixture and stir until the cheese melts, creating a delicious sauce. Serve with ground pepper and optionally with parsley.